The global industrial protective footwear market size is expected to reach USD 6.56 billion by 2024, according to a new report by Grand View Research, Inc. The substantial growth prospects of the market can be attributed to the rising number of worker accidents across global organizations. Comfort, innovation, safety, and aesthetic value are the key characteristics of the industrial safety footwear. The global shoe manufacturers over the years have been striving to integrate these features into their products in order to offer improved safety in the workplace as well as provide comfort to workers. Industrial protective shoes have been facing a substantial demand from various industries to avoid fatalities and accidents in the workplace. With a paradigm shift towards worker safety instead of maximizing profits, a huge demand has been created for protective footwear in hazardous work environments and is anticipated to drive the industry over the forecast period. In the recent years, safety wear has emerged as an increasingly preferred choice for many companies. These safety products are essential for the prevention and protection against occupational fatalities to workers as well as for the prevention of legal action towards organizations. However, the high sale volume of spurious and cheap products in the industry is envisioned to challenge the industry growth in the near future. Furthermore, due to the increasing popularity and rising demand for premium branded safety shoes, these products become the sole target for counterfeiting. Thus, high sales volume of counterfeit and low-quality products are expected to challenge the industry growth. Leather footwear is presumed to emerge as a predominant product over the forecast period. Leather is increasingly used in safety shoes to provide protection against fatal electric shocks due to its non-conductivity. Moreover, a genuine leather provides protection against falling objects, punctures, cutting hazards, burns, and extreme weather. The rubber safety shoe market was valued at over USD 120 million in 2015 and is expected to grow at a considerable rate over the forecast period. With the emerging use of intense colored rubber materials, safety shoes have now become ergonomically enhanced, water resistant, and lightweight, thereby making them a good choice for various industries. Construction is expected to emerge as a predominant application segment over the next eight years. Growth in this segment is primarily driven by the rising number of workplace accidents, which has, in turn, fueled the adoption of industrial shoes among infrastructure developers to improve occupation safety. Europe led the industry in terms of market share in 2015 and is expected to retain its dominance over the forecast period. The demand in this region is mainly driven by the implementation of standards and compliance with stringent regulations that mandate the use of safety shoes at the workplace. The widespread presence of safety shoe manufacturers in the region is anticipated to drive the industry growth in the region. Low-cost labor, capital, and raw materials, as well as low-interest loans and tax incentives, have forced footwear manufacturers to migrate from North America, UK, and Italy to Asia, especially China. Moreover, the Chinese government is presently attracting footwear manufacturers with various incentives and is working to shift the footwear production sites from the coastal regions to internal territories. Grand View Research has segmented the global industrial protective footwear market on the basis of product, application, and region. The global organic food & beverage market is expected to reach USD 320.5 billion by 2025, according to a new report by Grand View Research, Inc. Growing popularity of non-GMO products among consumers, owing to the health benefits associated with their consumption, is expected to drive the demand over the forecast period. Fruits and vegetables dominated the global organic food market accounted for over 37% of revenue share in 2015. Furthermore, increasing consumption of meat and poultry products resulted in the fastest growth of the segment and is expected to grow substantially at a CAGR of 13% over the forecast period. Non-dairy beverages such as rice, soymilk, and oat beverages accounted for over 33% of the total share of organic beverages market in 2015. However, beer and wine is projected to grow substantially at a CAGR of 13.5% over the forecast period owing to increasing global economic conditions and high consumption of a broad range of flavored beverages. The industry in Asia Pacific is projected to witness fastest growth over the forecast period and account for over 12% of global revenue by 2025. Asia Pacific is projected to witness highest growth on account of growing agriculture sector in the region coupled with robust domestic demand has led to significant demand for the product. The global injectable drug delivery market is expected to reach USD 931.1 billion by 2024, according to a new report by Grand View Research, Inc. The increase in number of chronic diseases like diabetes and cancer has fueled the need for injectable drug delivery. Unlike other traditional forms of drug delivery, injectables allow maximum bioavailability of the pharmaceutical drug as it bypasses the first pass metabolism. With substantial growth in technological advancements, the devices being manufactured and marketed are built so as to cater to the specific needs of the patients. With the advent of self-injection devices, injectable drugs can be self administered without the need of medical assistance. A large number of technology-oriented developments have taken place in the biologics market, which further increases the applicability of these injectable devices in the challenging disease areas. Self-injection devices have allowed patients suffering from diabetes to manage insulin levels with auto-injectors, pen-injectors, and needle-free injectors; thus, the homecare segment has been a large grosser in the end-user application. The major restraints in this market are injuries and infections caused by needles, ambiguities related to regulatory reimbursements, sterility of the injectable drugs, and the preference of other drug delivery systems that possess less toxicity and are easy to administer. Despite these restraints, the market potential for injectable drug delivery products is tremendous with majority of the key players opting to injectables over other forms of delivery. The injectable drug delivery industry, based on product type is segmented into two sub-types namely self-injection devices and conventional injection devices. Further, on the basis of therapeutic use, the injectable drug delivery industry is segmented into autoimmune disorders, hormonal disorders, oncology, and others. The injectable drug delivery industry by end-user application is categorized into hospitals, homecare settings, and others including research establishments, diagnostics, and clinical laboratories. North America is expected to lead the market for injectable drug delivery devices with the largest number of patients suffering from chronic diseases like diabetes and cancer along with autoimmune disorders. The reason why countries in North America are leading is due to the technological innovations and advanced research in the area that enable them to excel at designing new and improved drug delivery products. The Asia Pacific market is set to lead exceptionally well owing to the partnerships with other well established global players. This region has also witnessed enormous investments in research and development; thus, accelerating the growth of the injectables market in this region. The homecare settings has been the most profit garnering segment with a large cohort of patients suffering from chronic diseases and hence the resultant high utility of these devices at a primary level for better control and management of the disease. Some key market players include Pfizer, Inc., Schott AG, Becton, Dickinson and Company, Baxter International, Inc., and ELI Lilly & Co. The global palm methyl ester derivatives market is anticipated to reach USD 1.01 billion by 2025, according to a new report by Grand View Research, Inc. Growing demand for CPO and PKO derived products from a wide range of sectors including personal care, home care, and food along with other industrial products such as adhesives, lubricants, paints, coatings, and inks is expected to influence product demand over the forecast period. Palm methyl ester derivatives are essentially oleochemicals processed from CPO and PKO, leading to greater global demand driven by sustainability along with environmental and health concerns. Rising consumer preference for natural ingredients and process sustainability in personal care, food, and other sectors is also anticipated to boost product demand. In the past few years, the industry has witnessed increasing investments in R&D activities for the development of biodegradable products, which can substitute the petroleum-based ones. This, in turn, has led to increased dependence on these specialty chemicals. Some of the major application sectors of the products include homecare, personal care, and cosmetic products. Methyl oleate held the largest share in the market and is expected to continue its dominance over the forecast period. The increasing use of the product as solvents in industrial cleaners, as surfactants in personal care products, as solvents & defamers in the production of inks and coatings and as a lubricant for metal cleaning & precision metal cleaning are expected to be the major factors driving oleate demand over the forecast period. Companies such as P&G Chemicals, VVF, and KLK Oleo are integrated throughout the value chain from manufacturing of raw materials for downstream chemicals to finished products such as detergents, soaps, and personal care products. The global nano calcium carbonate market is expected to reach USD 9.65 billion by 2024, according to a new report by Grand View Research, Inc. Rising demand for nano calcium carbonate owing to increasing product usage in the end use industries including inks and pharmaceuticals on account of its superior dispersion properties is expected to drive the demand over the forecast period. Rising trend of people moving to urban centers in emerging regions including Asia Pacific and the Middle East is expected to drive the market over the next eight years. Surging application scope in the paper industry pertaining to increasing usage of the product in paper processing is expected to drive the demand over the next eight years. Growing technological shift of paper industry from acid to alkaline-based process is expected to fuel the market over the forecast period. Building & construction accounted for over 25% of the market in terms of revenue in 2015. The growth is accounted by increasing use of the product in building materials such as sealants and adhesives to improve the thermal expansion & resistance and improved workability. This, in turn, is likely to drive the market demand over the next eight years. The global nano calcium carbonate market demand in terms of volume was around 19 million tons in 2015 and is expected to cross 40 million tons by 2024, recording a CAGR of 8.7% from 2016 to 2024. Plastics is expected to be the fastest growing application segment registering a CAGR of around 9% from 2016 to 2024 accounting for over 20% of total market volume in 2015. Growing product demand in the plastics industry on account of its improved stability, easy processing, wear resistance and low-cost availability is likely to fuel the demand over the next eight years. 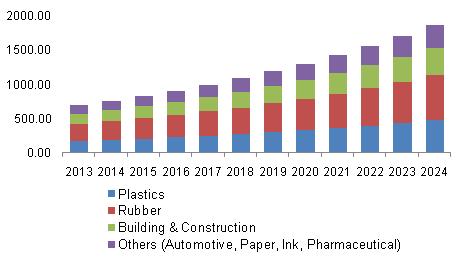 Rubber industry is expected to register a CAGR of over 8.3% from 2016 to 2024. Growing application scope of nano calcium carbonate in rubber processing industry on account of its ability to improve the toughness, hardness, and wear resistance of acrylonitrile–butadiene–styrene (ABS) rubber is likely to fuel the growth over the forecast period. Others segment include applications in automotive, inks and pharmaceuticals. This segment is expected to grow at a CAGR of 8.9% from 2016 to 2024. Growing use of adhesives and sealants in the automotive industry to join various metal and material substrates in the vehicle body fabrication coupled with rising R&D activities to improve the overall vehicle performance is likely to drive the demand for nano calcium carbonate in the automotive industry over the forecast period. Asia Pacific accounted for a significant market share of over 40% in 2015. Cost effective manufacturing owing to cheaper raw material availability and indigenous production is expected to drive the growth. The region is also projected to witness a CAGR of 8.4% over the forecast period. The industry is moderately fragmented with the presence of a large number of prominent market participants across the globe. Some leading companies operating in the global market include Specialty Minerals Inc., Imerys Performance Minerals, Omya, Enping Yueyi Chemistry Industry Co.,Ltd, Fujian Sanmu Nano Calcium Carbonate Co.,Ltd, and Mittal Enterprises (ShengdaTech, Inc.). Yuncheng Chemical Industrial Co., Ltd. has been specializing in manufacturing nanometer colloidal calcium carbonate, precipitated calcium carbonate as well as basic magnesium carbonate and gymnastic chalk & powder. In 2013, the company ended the strategic alliance with Jia Dah Chemical Industrial Co., Ltd. and started to market and distribute calcium carbonate directly to its customers. Grand View Research has segmented the fire resistant glass market by product, application, and region.